As readers of this humble tennis website knows, I am a fan of Angell racquets. I have tested the TC95 in two string patterns and stiffness ratings and the TC 97 18×20. So this Angell Custom TC 100 racquet review might seem long overdue. What do I like about Angell racquets? Well, I believe the build quality is very high, the feel is nice and comfortable and the possibility to order custom specs is simply brilliant. There is a reason Angell Tennis is developing quite a following. 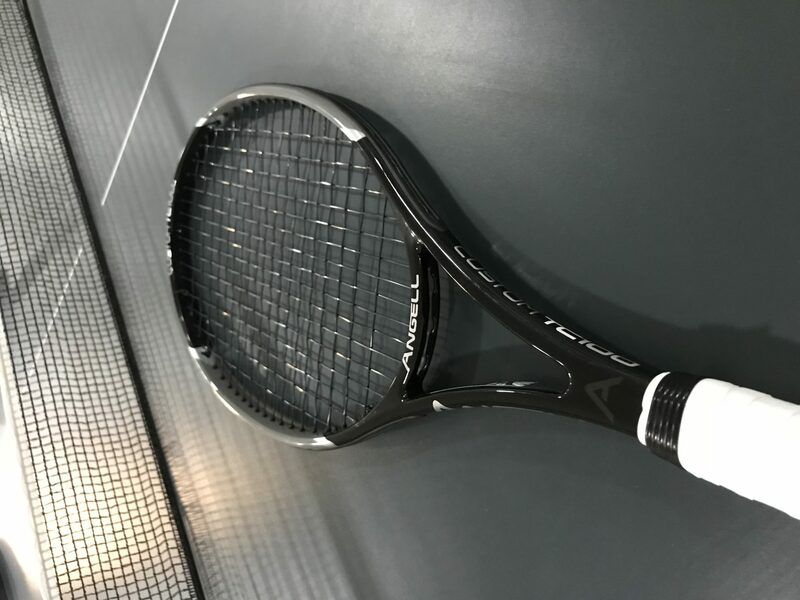 If you are interested in what I thought about the other Angell racquets I have tested, check out these links: Angell Custom TC 95 18×20, Angell Custom TC 95 16×19, Angell Custom TC 97 18×20 and Angell K7 Red. This is the Angell Custom TC 100 racquet review. Recently I have been playing with a customized Soft Drive with the specs of 328 grams and 33,2 cm balance strung with HEAD Hawk Touch (read my review here) at 24 kg. A large deviation from the kind of player racquet specs I usually enjoy (flexible, heavy, head-light racquets). The free power the Soft Drive (which is basically a Pure Drive Original with less static weight and a slightly, slightly softer feel) is intoxicating and I have been trying to shorten up my swing and add some more spin. Whether I will stick with this racquet remains to be seen. The free power helps, but I have sometimes experienced wrist pain with thicker-beamed / stiffer frames and that is my main concern right now. We will see if I can dial in the right setup for my game and body. The Angell TC 100 is also a 100 sq inch racquet, but the beam is thinner (20 mm), the stiffness is lower (I tested the 63 RA version) and the feel on impact is quite different. The TC 100 is more comfortable and predictable (control-oriented) than my current racquet, but lacks that elusive free power. At least in stock form. With some lead in the hoop it creates more oomph on the ball, but it is still no Pure Drive. On one hand the Angell Custom TC 100 is a really reliable racquet, but it is more difficult for me to finish points with the TC 100 than it is with the Soft Drive. If you want a more powerful frame, you can obviously try the 70 RA version. This will make the racquet stiffer and return more energy to the ball. The Angell TC 100 (RA 63) gives you more control your shots than a lot of 100 sq inch racquets. The Angell feel is there and for me it feels more similar on contact to the TC 95 (RA 63) than the TC 97 (RA 66). It gives you a bit more real estate in the racquet head than the TC 95 and slightly more power, but it still offers a really nice feel on slice and volleys which is not always common with 100 sq inch racquets. I did enjoy this racquet more at the net than I do with my current Soft Drive. Angell Custom TC 100 Racquet Review – How does it play? Do not expect a lot of power with this 63 RA version of the Angell Custom TC 100. It is predictable, offers decent spin and good feel. 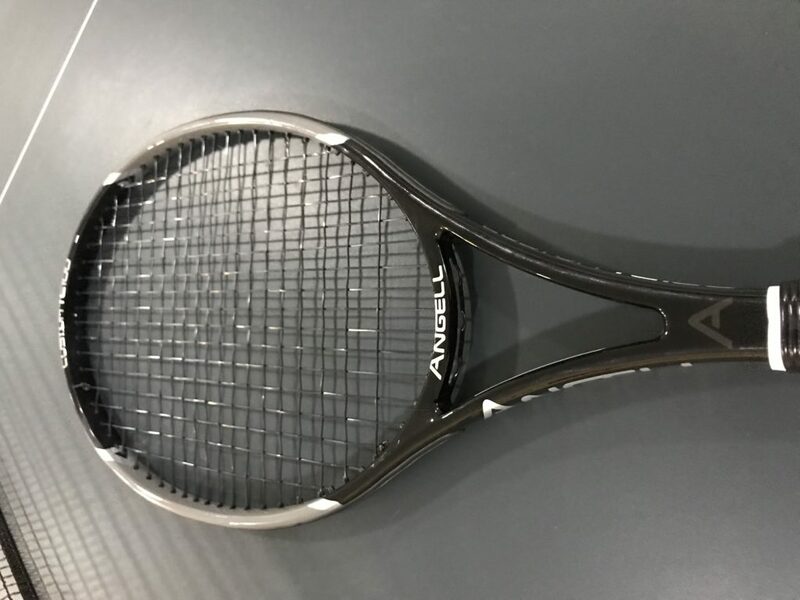 If I would liken this to other 100 sq inch racquets, it would be a Prince Phantom Pro 100P (read my review) or a Prince Textreme Tour 100P , which should be flattering because these are both excellent racquets. These racquets have tighter string patterns and thinner beams compared to a Wilson Burn 100 CV (read my review) or a Babolat Pure Drive (2018) (read my review). The Burn and the Pure Drive generates tons of spin and quite a high launch angle, while the Angell offers less spin but more predictability from the string bed. The Angell TC 100 simply gives you what you put in to it. You can not expect to blast winners from the baseline with this racquet, but need to be patient like old-school David Ferrer in building your points properly and moving your legs. Do not be fooled by the 100 sq inch head size, this is definitely a players racquet. I thought the stability of the frame was excellent despite the low stock weight. It might be the foam filled beam or just the lay-up of the racquet, but it did feel really nice on volleys and slice shots. It also offered good comfort for the arm despite the string being the stiffer Volkl Cyclone 1.25 (black ). I felt this racquet was highly playable even without lead tape, but adding some lead tape at 10 and 2 o’clock would open up some more power and add to the stable feel. Adding a leather grip will counterbalance the racquet nicely. I did have high expectations on this racquet since I have enjoyed pretty much every other Angell raccquet review and it did not disappoint. For a light 100 sq inch racquet, the Angell Custom TC 100 offers excellent feel and control. The only real downside for me was that I had to work harder to generate top spin and pace. This can be a good thing since it requires me to move better and play with more accurate technique, but since my movement is still suffering from the knee injury, I really appreciate being able to finish a point quickly. Therefore it would be interesting if Angell did a thicker beam racquet in a 100 sq inch option, like a 100 sq inch K7 Red for example in a 68 RA unstrung version. That could really lure in some Pure Drive and Pure Aero fans! Maybe we will see this from Angell in a near future? For now, let us look at my ratings of the Angell Custom TC 100. Power: 6/10 – Less powerful than many 100 sq inch racquets. If you want more power – go with the RA 70 version instead. Control: 8/10 – I felt like I was in full control of my shots with this frame. Spin: 6/10 – Not a spin monster, but a predictable racquet with a relatively low launch angle. Feel: 8/10 – Like all Angell racquets I have tried, I feel connected to the ball here. Comfort: 9/10 – No need to worry about arm problems here. Serves: 8/10 – With the lighter spec and thinner beam I felt like I could generate some good racquet head speed with this frame. Volleys: 8/10 – Really nice and stable despite the low weight. Groundstrokes: 7/10 – Maybe I am getting lazy but I need to work harder with this racquet than my current racquet of choice. It is another fine racquet from Angell. Pinpoint control, good comfort and a close connection to the ball makes this an excellent choice for medium to advanced players looking for a 100 sq inch racquet that still offers a reliable launch angle and good feel. If you need your racquet to help you with power and spin, there are better options. I definitely think all racquet connoisseurs need to check out Angell Tennis and their products. They play and feel great and the biggest bonus is that you can get the specs you want! Have you tried the TC 100? What did you think of it? Please comment below. how does this racket compare to the Angell K7? The K7 is more flexible/comfortable and has a more open string bed offering more spin but also a slightly less controlled response. I’ve had TC100 63ra and sold it because it was not comfortable enough for me. It did bother my shoulder. I think stiffness rating on this racquet does not tell the the whole story. You would think that racauet that has 63 should be soft. This one is firm. Not stiff but firm. It is a great performance racquet though. How does this compare with the prince 93p? Also noticed your seeing is different with the soft drive…. That was interesting. today I finally tested my Tc100 (ra63 / 310g / 320mm / 27.5) .. It has everything I look for: Stability, Plow Through and confort (not like POG107, but just the way I wanted). I used: Hyper-G 1.30 (main) x kirschbaum evolution 1.25 (cross) with 50 lbs. I played for 1.5 hours and my string is almost breaking. This racket is BIG a string breaker? Nice spec! I did not find the racquet to be a string breaker as the pattern is quite tight for a 100 sq inch. Could be that the shape of the Hyper-G notches on the softer Evolution string but 1.5 hours sounds like maybe one of the strings had some damage? Try using a full bed of either string next and see how it goes!